Outside the Box was retired on April 25, 2018, to make way for the new and improved premium research service, Over My Shoulder. If you’re interested in joining John Mauldin, Patrick Watson, and the thousands of Over My Shoulder subscribers as they analyse important research several times a week, please click here to find out how you can subscribe for less than $10 per month. I have talked at length in recent months about the well-proven limitations of Federal Reserve modeling of the economy. (See for instance “Data-Dependent ... on Imaginary Data.”) And come to think of it, I’ve been on their case for years. The Fed’s predictive capacities are demonstrably abysmal. In today’s Outside the Box, Ambrose Evans-Pritchard, the intrepid international business editor of the Daily Telegraph of London, joins the fray. The forward curve for the one-month Overnight Index Swap rate (OIS), which is a market proxy for the Fed policy rate, has flattened and inverted two years ahead. Ambrose notes that Fed officials like to rely on a different signal: the point where the 10-year US Treasury yield drops below the two-year yield. Problem is, this tends to happen several months after the OIS rate curve has already inverted. By then it’s often too late. The Fed’s tightening is putting the squeeze on the money supply. On the global front US rate rises are in effect being magnified, through the mechanism of LIBOR (the London Interbank Offered Rate). 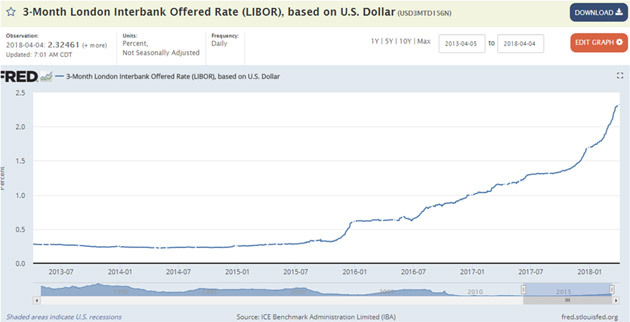 Three-month LIBOR – used to set the cost of borrowing on $9 trillion of US and global loans, and $200 trillion of derivatives – has surged 60 basis points since January, and the LIBOR-OIS spread (or LOIS) has widened. The last time that happened – to disastrous effect – was 2007. There is no sign yet that the Fed is having second thoughts about the wisdom of charging ahead with sabers drawn. The new chairman, Jay Powell, was strikingly hawkish in a recent speech, making it clear that he has no intention of bailing out Wall Street if equities tumble or credit spreads widen. He dismissed short-term shifts in the economy as meaningless noise. This is important stuff. We’re marching straight into the jaws of what, in last week’s Thoughts from the Frontline, I called the Great Reset. It’s one thing to boldly charge ahead on the policy front but quite another to head off the next global recession, born of chronic monetary and fiscal malfeasance. By the way, as I was reviewing my information sources the other day, something interesting occurred to me: Some of the best US economic analysis comes from outside the US. In theory, we should have a better grip on our own central bank and government, right? But in fact, my friends in Canada, Europe, Asia and elsewhere deliver consistently cogent thoughts as well. I haven’t done a formal tally, but I suspect I rely on them at least as much as I do on US sources. Why is that? Maybe it’s because distance gives you a different perspective. Non-Americans aren’t burdened with our cultural assumptions and can look just at the facts. They see things we Americans miss because to us they’re just part of the landscape. This underscores the importance of having both many information sources and the right sources. And you still have to prioritize, because none of us can read everything that competes for our views. I’ve figured out ways to deal with these issues, and I’ll be sharing them with you. Details soon. with your very own risk-free trial of Over My Shoulder. Join John Mauldin's private readers’ circle, today. The US credit markets are flashing a rare warning of economic trouble ahead, signalling that the Federal Reserve risks blundering into another recession without a deft change of course. A blizzard of surprisingly poor data across the world suggests that the Fed’s liquidity squeeze is taking a greater toll than widely assumed, and that the institution’s staff model has so far failed to pick up the danger signs. US jobs growth fizzled to stall-speed levels of 103,000 in March. The worldwide PMI gauge of manufacturing and services has dropped to a 14-month low. The average “Nowcast” tracker of global growth has slid suddenly to a quarterly rate of 3.2pc from 4.1pc as recently as early February. Analysts at JP Morgan say the forward curve for the one-month Overnight Index Swap rate (OIS) – a market proxy for the Fed policy rate – has flattened and “inverted” two years ahead. This is a collective bet by big institutional investors and fund managers that interest rates may be falling by then. It is a market verdict that Fed officials have lost touch with reality in thinking that they can safely raise rates another seven times to 3.5pc by late 2019, as implied by the “dot plot” forecast. It is tantamount to a recession warning. 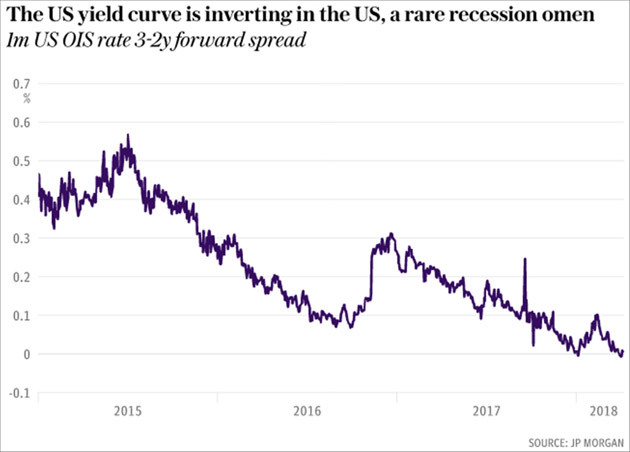 “An inversion at the front end of the US curve is a significant market development, not least because it occurs rather rarely. It is generally perceived as a bad omen for risky markets,” said Nikolaos Panigirtzoglou, JP Morgan’s market strategist. “Markets have started pricing in a Fed policy mistake or have started pricing in end-of-cycle dynamics,” he said. Both possibilities are disturbing. The OIS yield curve has inverted three times over the last two decades. In 1998 it proved to be a false alarm because the Greenspan Fed did a pirouette and flooded the system with liquidity. In 2000 it was a clear precursor of recession. In 2005 it signaled that the US housing boom was already starting to deflate. Fed officials tend to watch a different signal – the moment when the 10-year US Treasury yield drops below the two-year yield – deeming this the best single predictor of recessions in a study last month by the San Francisco Fed. This has not yet been triggered. The problem is that this tends to happen several months after the OIS rate curve has already inverted. By then it is often too late. Trouble is already baked into the pie. “We think that the current expansion will begin to fizzle out before long. US equities are likely to suffer once the US economy stalls, and a weaker US stock market would almost certainly be contagious, especially if growth in the rest of the world also faltered,” said Finn McLaughlin from Capital Economics. The Fed’s monetary tightening is now biting hard. Growth of the “broad” M3 money supply in the US has slowed to a 2pc rate over the last three months (annualised) as the Fed shrinks its $4.4 trillion (£3.1 trillion) balance sheet, close to stall speed and pointing to a “growth recession” by early 2019. Narrow real M1 money has actually contracted slightly since November. This suggests that the reversal of quantitative easing may matter more than generally appreciated. The Fed’s bond sales have been running at a pace of $20bn a month. This rises to $30bn this month, reaching $50bn by the fourth quarter. RBC Capital Markets says this will drain M3 money by roughly $300bn a year, ceteris paribus. What worries monetarists is that the Fed intends to step up the pace of quantitative tightening (QT) regardless of the monetary slowdown. The institution adheres closely to a New Keynesian “creditist” model and pays little attention to monetary aggregates. This proved a costly mistake in 2008. US rate rises are having a parallel effect, but through a different mechanism. 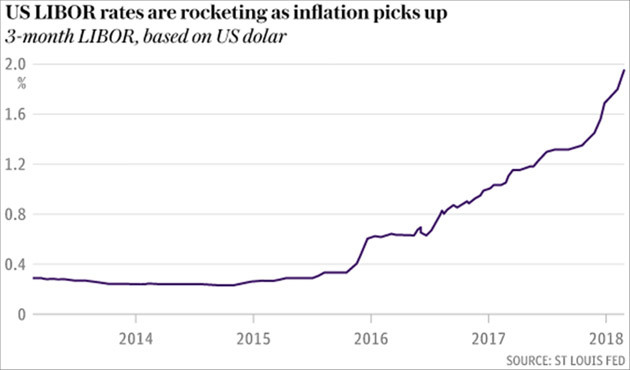 Three-month Libor rates – used to set the cost of borrowing on $9 trillion of US and global loans, and $200 trillion of derivatives – have surged 60 basis points since January. The Fed view is that Donald Trump’s unwarranted fiscal stimulus – lifting the budget deficit to 5pc of GDP at the top of the cycle – is inflationary and increases the risk of over-heating. The signs of a slowdown are even clearer in Europe where the low-hanging fruit of post-depression recovery has largely been picked and the boom is fizzling out, exposing the underlying fragilities of a banking system with €1 trillion of lingering bad debts. Citigroup’s economic surprise index for the region has seen the worst four-month deterioration since 2008. A reduction in the pace of QE from $80bn to $30bn a month has removed a key prop. The European Central Bank’s bond purchase programme expires altogether in September. What is surprising is that Germany is slowing hard despite a seriously undervalued currency (for Germany, not for France or Italy). Industrial output has contracted over the last three months and exports suffered the steepest dive for three years in February. Germany is highly leveraged to the Chinese industrial cycle so this may be a sign that Chinese growth has slowed more than the authorities admit – as indicated by plummeting yields on Chinese bonds, and rates on three-month Shibor and certificates of deposit. The world economy was coming off the boil even before President Trump launched an escalating trade war against China. The global money supply has been slowing since last September. 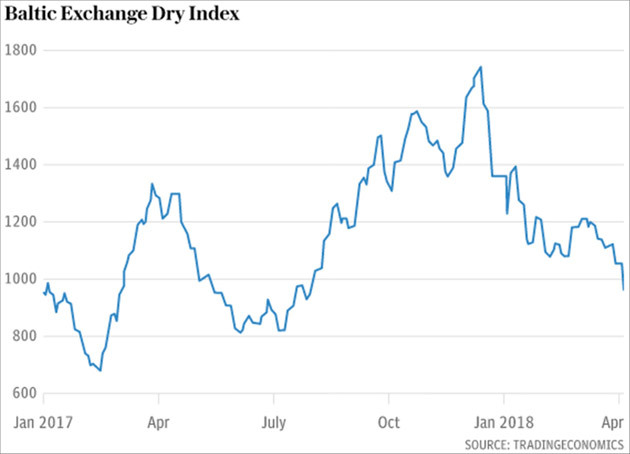 The Baltic Dry Index measuring freight rates for dry goods peaked in mid-December and has since dropped 45pc. The Fed, the ECB, and the global authorities insist that this is a temporary “air pocket”, and that synchronized world growth is alive and well. The bond markets do not entirely believe them. We welcome your comments. Please comply with our Community Rules. April 11, 2018, 9:26 p.m.
John prattles on about the “heavily Democractic biased Yellen Fed” and how interest rates should have been raised sooner “when the economy was doing well” allegedly, rather than the more problematic present. But, he blithely slides past the fact that there never was a time earlier in this economic cycle when inflation threatened to consistently breach the 2% threshold, the threat of which is a necessary condition for triggering rate increases. He berates the Fed’s “fear of going too far” under Yellen, implying that this fear was unjustified, yet the fact is that rate increases in the lower inflation environment that persisted for years after the Great Recession indeed did threaten to provoke a deflationary downturn. His criticism is far from credible, at least not without much better substantiation. April 11, 2018, 5:15 p.m. The FED’s economic models are out dated, antiquated and ill-fated. Pretending that they can control the economy by controlling debt is ludicrous since the government is responsible for a lion’s share of debt. The FED was originally designed to buy corporate paper whenever the banks stopped lending in order to keep the economy upright. That only lasted the first few years until Congress passed legislation ordering the FED to buy only government paper. Well, here we are again and the crossroads keep leading farther and farther away from economic sobriety and free capitalistic desires. © 2019 Mauldin Economics. All Rights Reserved. Outside the Box is a free weekly economic e-letter by best-selling author and renowned financial expert, John Mauldin. You can learn more and get your free subscription by visiting www.MauldinEconomics.com. Please write to subscribers@mauldineconomics.com to inform us of any reproductions, including when and where copy will be reproduced. You must keep the letter intact, from introduction to disclaimers. If you would like to quote brief portions only, please reference www.MauldinEconomics.com. Outside the Box and MauldinEconomics.com is not an offering for any investment. It represents only the opinions of John Mauldin and those that he interviews. Any views expressed are provided for information purposes only and should not be construed in any way as an offer, an endorsement, or inducement to invest and is not in any way a testimony of, or associated with, Mauldin's other firms. John Mauldin is the Chairman of Mauldin Economics, LLC. He also is the President of Mauldin Solutions, LLC, which is an investment advisory firm registered with multiple states, President and registered representative of Millennium Wave Securities, LLC, (MWS) member FINRA, SIPC, through which securities may be offered . MWS is also a Commodity Trading Advisor (CTA) registered with the CFTC, as well as an Introducing Broker (IB) and NFA Member. Millennium Wave Investments is a dba of MWA LLC and MWS LLC. This message may contain information that is confidential or privileged and is intended only for the individual or entity named above and does not constitute an offer for or advice about any alternative investment product. Such advice can only be made when accompanied by a prospectus or similar offering document. Past performance is not indicative of future performance. Please make sure to review important disclosures at the end of each article. Mauldin companies may have a marketing relationship with products and services mentioned in this letter for a fee. Note: Joining The Mauldin Circle is not an offering for any investment. It represents only the opinions of John Mauldin and Millennium Wave Investments. It is intended solely for investors who have registered with Millennium Wave Investments and its partners at www.MauldinCircle.com (formerly AccreditedInvestor.ws) or directly related websites. The Mauldin Circle may send out material that is provided on a confidential basis, and subscribers to the Mauldin Circle are not to send this letter to anyone other than their professional investment counselors. Investors should discuss any investment with their personal investment counsel. You are advised to discuss with your financial advisers your investment options and whether any investment is suitable for your specific needs prior to making any investments. John Mauldin is the President of Mauldin Solutions, LLC, which is an investment advisory firm registered with multiple states. John Mauldin is a registered representative of Millennium Wave Securities, LLC, (MWS), an FINRA registered broker-dealer. Millennium Wave Investments cooperates in the consulting on and marketing of private and non-private investment offerings with other independent firms such as Altegris Investments; Capital Management Group; Absolute Return Partners, LLP; Fynn Capital; Nicola Wealth Management; and Plexus Asset Management. Investment offerings recommended by Mauldin may pay a portion of their fees to these independent firms, who will share 1/3 of those fees with MWS and thus with Mauldin. Any views expressed herein are provided for information purposes only and should not be construed in any way as an offer, an endorsement, or inducement to invest with any CTA, fund, or program mentioned here or elsewhere. Before seeking any advisor's services or making an investment in a fund, investors must read and examine thoroughly the respective disclosure document or offering memorandum. Since these firms and Mauldin receive fees from the funds they recommend/market, they only recommend/market products with which they have been able to negotiate fee arrangements. PAST RESULTS ARE NOT INDICATIVE OF FUTURE RESULTS. THERE IS RISK OF LOSS AS WELL AS THE OPPORTUNITY FOR GAIN WHEN INVESTING IN MANAGED FUNDS. WHEN CONSIDERING ALTERNATIVE INVESTMENTS, INCLUDING HEDGE FUNDS, YOU SHOULD CONSIDER VARIOUS RISKS INCLUDING THE FACT THAT SOME PRODUCTS: OFTEN ENGAGE IN LEVERAGING AND OTHER SPECULATIVE INVESTMENT PRACTICES THAT MAY INCREASE THE RISK OF INVESTMENT LOSS, CAN BE ILLIQUID, ARE NOT REQUIRED TO PROVIDE PERIODIC PRICING OR VALUATION INFORMATION TO INVESTORS, MAY INVOLVE COMPLEX TAX STRUCTURES AND DELAYS IN DISTRIBUTING IMPORTANT TAX INFORMATION, ARE NOT SUBJECT TO THE SAME REGULATORY REQUIREMENTS AS MUTUAL FUNDS, OFTEN CHARGE HIGH FEES, AND IN MANY CASES THE UNDERLYING INVESTMENTS ARE NOT TRANSPARENT AND ARE KNOWN ONLY TO THE INVESTMENT MANAGER. Alternative investment performance can be volatile. An investor could lose all or a substantial amount of his or her investment. Often, alternative investment fund and account managers have total trading authority over their funds or accounts; the use of a single advisor applying generally similar trading programs could mean lack of diversification and, consequently, higher risk. There is often no secondary market for an investor's interest in alternative investments, and none is expected to develop. All material presented herein is believed to be reliable but we cannot attest to its accuracy. Opinions expressed in these reports may change without prior notice. John Mauldin and/or the staffs may or may not have investments in any funds cited above as well as economic interest. John Mauldin can be reached at 800-829-7273.